Pictures were taken outside yesterday. 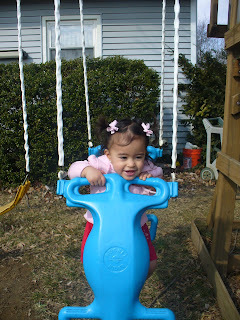 It was such a ridiculously wonderful weather that i just could not resist taking Kaitlyn out to our backyard. She had on a red dress with her pink sweater. She looked so cute and was so happy to be out of the house and be able to run around and enjoy. 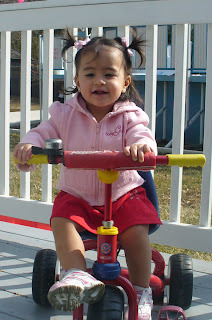 The first two pictures where taken on our deck while she was on her big sisters bicycle, it hers now since its to small for big sister. 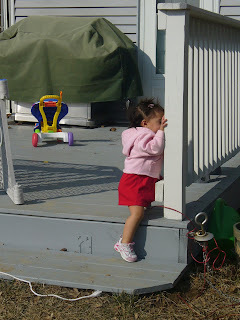 The second pictures was of her getting down the deck and heading to the swing set. She loves the swing set and would stay there for hours if we let her. Getting out yesterday also allowed me and MIL to pick up the dog poop scattered around in the backyard. Thank God Ralph was not there to see all of those poop or else he would have a fit. He hates the thought of the dog pooping on the grass since the girls will be running around in the backyard this summer. We still have not finished picking all of those up but with today weather again I'm sure ill go to it. 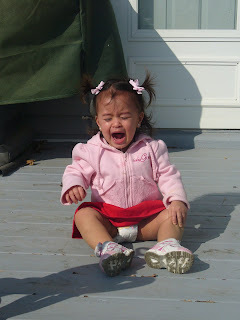 As for the last picture that is of Kaitlyn crying her eyes out and throwing her temper tantrum when told it was time to go inside. She was out there for more than an hour and she did not want to come in and was not hesitant about letting me and MIMA" grandma" know her disappointment and anger. My,my, kaitlyn is a big girl now, and into fashion. But in someways she's is still a little baby, just look at the way she cries. 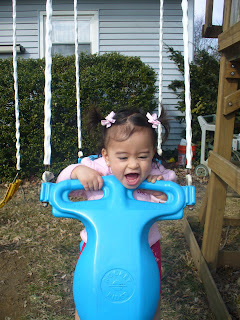 she's is so adorable manding, you're little melody. hahaha.. mao diay nihilak kay dili pa gusto mosulod ug balik inside the house. She is growing so well and so cute too , Lods. Oh I am feeling the warm weather envy here. Good for you getting your little one and yourself out there. I miss the sun here in the snow belt! Just like Frankie kong pasudlon na from outside. Mag wild kay di jud mosulod. Sos I can't blame them uy. Nindot man sad jud sa gawas kong ok lang ang weather. Ka cute sa baby K Lods uy. Belated Valentines diay ninyo diha.